Last week, 21-year old Dylann Roof murdered nine people with a handgun in a church in Charleston, South Carolina. Over the course of the last week, much has been said about this in the American press, and I want to discuss some of the moral and political questions at stake here. Question 1: Why did Dylann Roof murder these people, and why do people want to commit mass murder more generally? Roof also has written a racist manifesto. The manifesto is morally repugnant and extremely stupid. 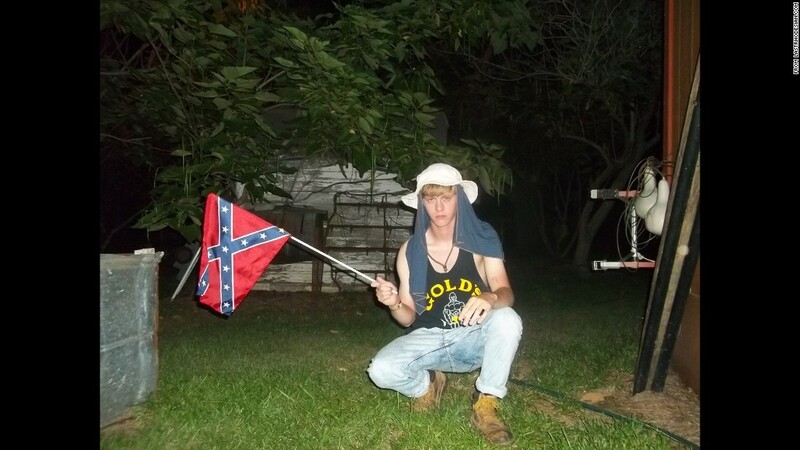 It is clear that racism is the proximate motivation for Roof–he chose to kill these people in this way at this time because of his racist beliefs. That said, there are a great many people who believe repugnant things who do not condone violent acts of this kind. On Stormfront, a popular internet forum among white supremacists, many people with similarly repugnant beliefs condemned Roof’s violent actions, (they also engaged in a lot of ridiculous conspiracy theories alleging that the government and media have made Roof look like a white supremacist to discredit them). There are also many mass shooters who are not explicitly racist in the way that Roof is. What they all have in common is a disturbed personality–they have all been inadequately socialized. As I said after the Elliot Rodger mass shooting, racism and sexism do not turn people into mass shooters, they merely provide targets for people who have deeply flawed personalities. These people are already predisposed to violence and have access to extremely lethal weapons. Racism caused Dylann Roof to target these specific people, but Roof’s personality made him capable of committing mass murder. All racists have repugnant views, but only a small percentage are willing to act on those views in the way that Roof did. Roof was inadequately socialized in some way–he was unable to find a constructive social role for himself, and he became marginalized and alienated. When people cannot find happiness and self-actualization, they look for some external group or person to blame. The group they select varies. For Rodger, it was women, for Roof, it was blacks. For ISIS, it’s non-Sunni Muslims. For Hitler, it was Jews. The key thing to bear in mind is that the violent hatred is driven by the marginalization and by the damaged personality, not the reverse. People become racists because they are damaged, and they become violent racists because they are severely damaged. No reasonable, well-socialized person chooses to become a white supremacist, and certainly not a violent one. So while it is always a good thing to ask what we can do about racism and sexism, we should bear in mind that one very effective way to counter these repugnant views and the violent acts that sometimes accompany them is to take better care of marginalized people in the first place, to ensure that they are adequately socialized. Question 2: Should we call Dylann Roof a terrorist? We can treat white Christian murderers the way we treat other murderers. We can treat other murderers the way we treat white Christian murderers. There has been a presumption that the right way to resolve the inequity is to treat Christian murderers the way we treat other murderers–by calling them “terrorists” or “thugs”. This is a mistake. We treat Christian murderers like real people. We try to understand their motivations and the various social and political forces that cause them to be violent. This is a very productive thing to do. We need to understand how people are becoming inadequately socialized and how inadequately socialized people are getting access to weapons if we’re going to reduce the number of inadequately socialized people and render the remainder less dangerous. When we call non-white murderers “terrorists” or “thugs”, we dismiss their actions as intrinsically and chaotically evil. We divest ourselves of collective social responsibility for them and we pass up our opportunity to reflect on how we avoid creating angry young people and help those we have created. The results of this have been devastating–after 9/11, we did not try to understand how the members of Al Qaeda became inadequately socialized or why they chose to blame us. We did not try to modify our policy to reduce the number of inadequately socialized people in the Middle East or to prevent inadequately socialized Middle Easterners from blaming us for their situations. We assumed that these people were storybook villains and that the only way we could deal with them was by killing them and erecting an extensive security apparatus. These measures are extremely expensive and they don’t solve the problem. The Middle East has only become more unstable and more hopeless for the people who live there, and this has produced many more inadequately socialized people. These people see our troops and our drone strikes and this makes them even more likely to blame the west for their situations. On a more domestic level, our tendency to dismiss black murderers as “thugs” has made us ignore the reality that we have serious racial inequalities in our society, that these inequalities cause blacks to become inadequately socialized, and that this results in acts of violent desperation by angry young blacks. If we start treating white Christian murderers this way, we are only going to make it harder for ourselves to get to the bottom of why people are violent and what we can do about it. By blaming murderers and treating them as inhuman villains, we perpetuate the social and structural conditions that lead people to become murderers. It can be very difficult to have compassion and empathy for the people who inflict such horrific pain on our society, but this is necessary if we want to solve the underlying problems. We need to stop seeing murderers as the disease and instead recognize them as symptoms of larger social and economic phenomena. Now, some people object that on a textbook definition, Roof was a terrorist–he’s a non-state actor who killed people to spread terror for political purposes. But this misses the point. The word “terrorist” does not merely describe such a person, it is accompanied with a bunch of negative baggage that encourages us to dehumanize people and treat them as villains. In light of that, it may never be a good move even to call textbook terrorists by the name. These are merely inadequately socialized individuals who have committed murder as a result. They act in a wrongful, repugnant way, but they are not villains–they are not to blame for the way that they are. Insofar as terrorists are villains, no one is terrorist. We ought to use the word only if we have the philosophical maturity do so without implying or inferring villainy. Question 3: How do we stop this from happening again? Reduce the number of people who might commit murder. Reduce the ability of people who might commit murder to do damage. The first strategy can be implemented in a structural way that goes after the root causes of murder, or it can be implemented in an agentic way that merely blames and targets the symptoms–the murderers themselves. We are too agentic in our approach. We try to kill or imprison individual murderers instead of considering murder as a social pathology. We should enact policies that lower economic inequalities, lift people out of poverty, and improve access to and quality of mental health treatment and prevention. There are no good arguments against gun control–I have written about the issue many times and have responded to many bad arguments, but these arguments do little good because second amendment enthusiasts hold their position irrationally. Question 4: Will taking down the confederate flag help? The confederate flag is a morally repugnant symbol of racism, exploitation, and treason. Private individuals should be permitted to fly the flag because free speech entitles people to hold and express repugnant views, but it is abhorrent for the governments in these southern states to fly these flags. By flying them, the state governments implicitly endorse racism and show unequal concern for the interests of their black citizens. They also implicitly endorse treason against the federal government–even for this reason alone, the federal government should not permit states to fly these flags. Obviously the state governments should take down all flags displaying the confederate symbol and should have done so long ago. They never should have put them up in the first place in the 1860’s, and the federal government should never have permitted state governments to fly the flags for any reason at any point in time. But is this going to solve the murder problem or structural racism? Obviously not. Taking down the confederate flags is not going to redistribute opportunities and resources to poor blacks. Even if it did, this would not reduce the homicide rate except insofar as it also tackled the overall poverty, inequality, and mental illness rates, as well as the number of guns in private hands. This is a symbolic gesture. It’s a nice thing, to be sure, but it is not going to substantively improve the lives of poor, marginalized people or have any substantive influence over the murder rate. Nearly everyone can feel good about themselves by opposing the confederate flag, but only because this requires no sacrifice on their part and consequently cannot solve anything. By shifting the national conversation to the confederate flag and away from the substantive structural issues that sustain racism and murder, we have done ourselves a disservice and helped the gun lobby and the opponents of equality and prosperity ensure that there will be many more deaths in the years to come, and many more occasions for me to write posts like this one. The flag debate does little more than placate an outraged public with a token victory, leaving the rest of the system untouched. This is distraction politics, and it’s what happens when we react to political events with outrage, blame, and vitriol rather than with calm and collected analysis. We are confronted with adult problems and a rare opportunity to do something meaningful about them, and we respond by running around like screaming children. Good thinking, Ben. Thanks. What a novel idea. . .to act like adults. A flag is something that holds no truck with racism.It is used by foreigners to expurge the rubbish that anyone that respects a flag is a loony racist-take a look at the way Pakistanis and Indians use this to their advantage when calling the British racist for flying the Union Flag in their own country ! The British are told by their own government that they cannot fly the Union Jack in case they offend Muslims. This isn’t an issue with racism or ‘offending Muslims’, as you say – it’s not even an issue. This is just some ridiculous, old planning permission law that has been repealed, but who euro-sceptics and xenophobes continue to perpetuate for their own agenda. It has nothing to do with offending anyone, and anyone who claims that this is the case is just – quite ironically – falling into the very trap that this article discusses – they are trying to blame a marginalised minority of affecting their lives in some way, as they are not happy with their lives and want someone to blame that doesn’t implicate themselves. Foreigners are the easiest target. There are many intrinsic problems with the UK, not least staggering (and growing) inequality based on poor government legislation. But it’s nice to think that rather than discuss growing child poverty rates* and massively increasing inequality, we can argue about whether it is seen as racist to hang the St. George’s flag on your house. *UK child poverty is calculated as a child that lives in a house 60% below the national average income. Recently it was reported that child poverty has not increased in recent years, despite massive government cuts to child welfare in the UK. This is, however, a bogus statistic. Child poverty is relative to overall average earnings – which have dropped in recent years for large swathes of the population. As such, the bar for measuring child poverty has dropped, yet there are still just as many children below the bar. As such, child poverty has – in real terms – very much increased. The growing inequality of earnings in London and the northern cities also means that child poverty is calculated very much different in different regions, further adding to the mix. David Cameron was correct when he argued that the way child poverty is measured needed changing – it does, but not in the way he argued. He wanted the definition changed as he was very worried that his cuts would result in an increased in child poverty, so wanted to make it harder to define, which is (to use the word again) a repugnant moral position. But the very fact that he genuinely speculated his cuts may increase child poverty (and proved this by preparing legislation to mask his cuts) yet still going ahead with £13bn in future welfare cuts just shows what a nasty man he is, and what a nasty party he runs. And why we celebrate that child poverty hasn’t increased and has stayed the same is beyond me. We should be mortified that, in such a rich country, in the year 2015, child poverty hasn’t declined. It’s absolutely disgraceful. But then I guess the argument of the Conservative Party isn’t progress – it’s the status quo. If anything, we should be glad that they are not trying to be regressive and revert. For me the most interesting point was about how the confederate flag is simply a distraction from the real issues, which are that we need to consider — analyse — the real causes of racism. I think this phrase ‘inadequate socialisation’ is also very useful. People need to adequately socialised if they are not to turn on each other. The failure is always societies as a whole, not individuals who have lost sight of the community to which they belong, especially when that wider society to which the community belongs, the nation state, does everything to undermine their opportunity and aspiration through economic and political inequality. Inadequately socialised individuals is a useful definition. People in our society are desperately unequal economically, politically and ultimately socially. This inevitably leads to social breakdown and violence. The other aspect of this article was the thesis that the confederate flag is a mere distraction. Symbols like these are like a torch lit at night, people gather round the fire, no matter what is being burnt because flags are designed, very effectively, to rally people…the confederate flag is an ugly anachronism, and it is a cruel irony, that it still has the power to attract such misplaced projections, but it is a mere distraction. It focuses our attention on the wrong issues. We need to look at the causes of inequality, as Studebaker has argued, which are economical, political and social. What amazes me, as a Brit, is that only in the USA could you discuss this without mentioning the biggest contributory factor: Less guns will mean less murders. It really is that simple. The difference between the UK and USA wrt to murder with firearms is that for every one firearms murder in the UK, there are 669 in the USA. I fully expect howls of anguish but it’s a fact, you do the math! Less guns will limit a violent person’s ability to deal damage, but it won’t help tackle what causes the violent tendencies in the first place. If we try to tackle the problem simply by removing guns, the violent mavericks will simply resort to other weapons instead, such as knifes, axes or machetes, and situations like the Lee Rigby slaughter – the mentality and capacity for violence still exists. The only way to stop it is to stop trying to mask the problem, ask what causes it and address it at its source. Ask not what weapon a person reached for, but why they felt the need to reach for a weapon in the first place. Another comparison to make is that Sweden, for example, has 0.19 homicides per 100,000 people, despite 31.6% of people owning guns. The UK has 0.05 homicides per 100,000 people, with a gun ownership of 6.6%. As such, despite having 5 times as many people with firearms in Sweden, the homicide rate due to fire arms is less than 4 times as great. The US, on the other hand, has 3.55 homicides per 100,000 – over 70 times as many firearm-related homicides as the UK – with a gun ownership of about 88% (14 times as many people proportionally own guns). As such, despite both Sweden and the US having many more people owning guns, the homicide rate goes up massively in the US proportional to gun ownership, but actually drops slightly in Sweden. 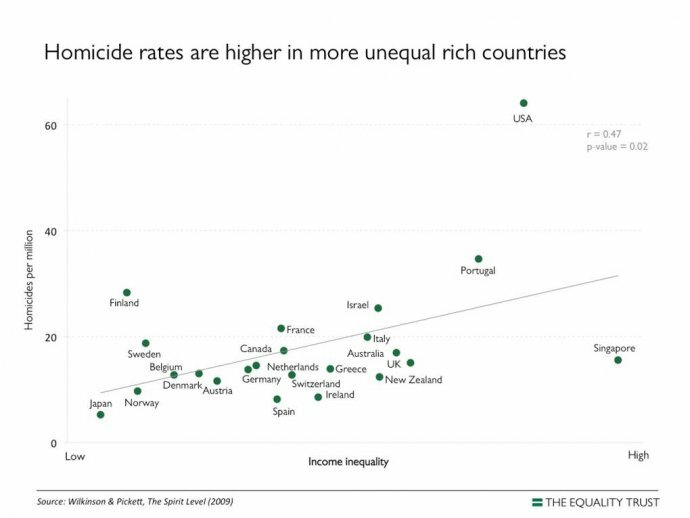 The reason for this non-linear increase is that crime as a whole is higher in the US, due to varying factors such as inequality. Sweden, which is much more economically equal, has a much lower crime rate, and thus a much lower gun-crime rate. You take away the guns, murder rates will drop because people will have less access to devastating weaponry, but they will persist as long as there is crime, and will simply find other weaponry to use. All you are doing is limiting the effects of a problem whilst not tackling the cause of the problem. You are simply putting rubber tips on the dangerous dogs’ teeth, without asking what caused the dog to become violent in the first place. While it’s true that Sweden has managed to achieve a homicide rate that is disproportionately low in comparison with its gun ownership rate, even Sweden has only 31 guns per 100 residents, compared to almost 89 for the US. Sweden is also just one case–Norway has roughly the same gun ownership rate as Sweden but a murder rate that is three times higher. When you look at all of the developed countries together as a group, it’s clear that there is a significant statistical relationship between gun ownership and homicide. Of course other factors play a role, and of course we should enact policies that address those factors, but we shouldn’t ignore or downplay the gun angle. Oh, only 133 times more likely then? FGS, are you capable of rational thought? Ditch the guns, it’s very difficult to shoot someone without a gun, trust me on this. Remove the tools and the job gets far more difficult. I agree with all your commentators. Guns are not the answer. Anilizing sociellogical behavior and warning signs should be top priority. As a first-time reader of your site, I agree with many of your points in this post and look forward to reading what you have to say on other topics. But, I don’t see how you can fairly assert this. It can be seen as quite simplistic to say that murders, mass and otherwise, stem from inadequately socialized individuals, and more broadly, that individuals who do go on to act violently due their ill-conceived concepts are suffering from some sort of personality inclination. I understand where you are coming from and how you have reached this conclusion, and sure, the characterization may be useful in describing some cases with respect to how a person relates and fits into our society and how harmonious her position within this social system may contribute to her actions. But, I do think a distinction needs to be made in certain situations. It doesn’t apply so cookie-cutter all the time. One can argue that an adequately socialized person in this society tends to favor the ideals of racism and white supremacy. And from there, one can reach the conclusion that acting upon that socialization is a reasonable course of action, not merely a predisposition. Our society propagates harmful social conditioning in many forms that women and men come to contact with every day. So much, that individuals remain in a constant struggle for rebellious awareness, and purposely fight this phenomena by actively attempting to re-wire their behaviors and thoughts in the presence of these messages. I think America is still at a time, and will be for a long time, in which the current socialization is still at odds with what society’s key players and maybe even the general community itself, may want to achieve. Ideally, that is. What is the passing of time but a look at how far removed we are from the past. With the culmination of the civil rights movement occurring just fifty decades ago, and before it, another couple centuries of slavery, dehumanization of non-whites, and evolution of racist thought, I would be surprised if socialization has caught up with people’s present moral inclinations. Socialization is a huge, convoluted process backed by pretty much everything that came before it. It’s a structure born from the past to guide the present.It’s always going to be a bit behind. I don’t think anyone can claim that those members who participated in the slave trade, those members who went on lynching hunts, those people who raped their “property” at the end of the night, those people who spit on the help were inadequately socialized. The tragedy remains that they were properly socialized with the times and propelled on by the longstanding popular ideals — moral, social, economical, and political in nature. That socialization promoted hatred. What Dylann did was a pure act of hatred fueled by the cultural subtext of our country. I think it is useful to acknowledge that socialization and not believe that Dylann has acted somehow against it as you claim, but rather, didn’t deliberately and continuously shield himself from it. But, it’s even more crucial to not lose sight of the individual’s role in his actions. With so much theory, one may be tempted to place the responsibility, and thus blame, on only one element. We should recognize both the society and the individual’s role in the situation. But then realize the balance will differ from case to case as some messages are stronger and more deeply rooted than others, some messages create a system which give less power to some and more power to others and thus present an inequality of choice and opportunity as you’ve pointed out, and this inequality and dearth of choice may ascribe more or less blame to said actor. A thief who commits crime as a means of survival since his society has refused to properly consider him from a young age should not be categorized with a racist who commits crime as a means to withhold the power structure of the past and present which favors him. Are they both inadequately or adequately socialized, and to the same level? Do they even belong to the same society? If not, does each society possess similar strength in their country? And if they do belong to the same society, does its structure recognize both as members equally regardless of background? Adequately socialized or inadequately socialized, it makes no difference if the access to firearms is curtailed as it is here in the UK. Less guns = less killings. It absolutely does make a difference, and refusal to recognize and account for that difference is one of the many ways our society perpetuates the problem. Focusing on the symptoms of harmful socialization is different than healing the root causes which breeds such dangerous hostility in the first place. One can not expect that simply taping a bandage over a wound will prevent the wound from continuing to grow uglier and more deadly underneath. Once we appropriately label the actions of certain individuals and stop surrounding those who commit them with the misguided rhetoric of a personality defect which predisposes them to violence or the effects of inadequate socialization, we can begin to build the functional knowledge needed to correct the crux of issue. So as you can understand, language, how we choose to describe behavior and actions, and what that tells us of our comprehension of them, is highly important. Or else, we’re continuing to ignore the problem where it stands. Anyway, I only responded to the first question Benjamin posed. We should have a balanced, comprehensive solution targeting all facets of the problem as hatred usually has a way of rearing its ugly head, and it’s not confined within the barrel of a gun. Strong federal gun control laws would absolutely make a big difference to the homicide rate, though it would have less of an impact on racism. I think we’re working with very different understandings of what “inadequately socialized” means. For me, a person is inadequately socialized if they have learned to believe in any principles or values or learned any behaviors that have net negative social consequences, regardless of whether or not those principles, values, or behaviors are supported by other people. 1. You do what you do, in any given situation, because of the way you are. 2. To be ultimately responsible for what you do, you have to be ultimately responsible for the way you are — at least in certain crucial mental respects. 3. But you cannot be ultimately responsible for the way you are in any respect at all. 4. So you cannot be ultimately responsible for what you do. I guess we were operating on different definitions of inadequate socialization. I took it to mean that his or her socialization somehow did not mesh with the greater society, when it in fact, does. Your definition suggests that inadequate socialization is only governed by you and what you consider to be net negative social consequences. Your measuring stick is what you are using to judge others and analyze behavior, which runs the risk of rendering it not applicable in the greater scheme of things as context may be overlooked. Which again raises the question of whether the white individuals in the past who sought to hold down an entire race using horrific measures, were “inadequately” socialized. By your definition, you would say yes. And by the extension of your logic, those who committed awful acts to other humans in that time period, had some sort of personality flaw. I disagree, and I think it’s important to realize how the cultural/societal backdrop of individuals may be pushing actors to act in abhorrent ways to uphold wide-spread beliefs, which gains power precisely through its support by other people and is sustained through socialization itself. And to respond to your second point. Is it your belief that individuals should not be held responsible for their actions? I acknowledge society’s role in influencing individuals’ actions, but I don’t believe absolving all individual responsibility is a sensible leap of logic, after the fact. In other words, you are the product of your environment, nevertheless, your environment does not create the end-product. I reckon there’s a balance. It’s not a subjective concept–inadequate socialization entails any set of beliefs, values, or behaviors that yield morally undesirable outcomes. “Morally undesirable” is an objective moral concept that is open to normative philosophical debate. This need not be a personality flaw–I’m not accusing these people of necessarily having personality disorders. They need only have beliefs that it would be better if they did not have. Yes, I don’t believe in holding individuals accountable for their actions. I believe in creating structural incentives that produce the kinds of beliefs, values, and behaviors that are morally desirable (subject to the aforementioned objective normative philosophical debate). I believe that all behaviors result from the kinds of beings that we are and that the kinds of beings that we are is determined by some combination of environment, heredity, and quantum randomness. Individuals do not control any of those things, so they do not control what they are or what they do, and therefore they should never be blamed.